Simon Blendis joined the LMP as Leader in 2014. As well as leading for a wide variety of concerts, Simon has particularly enjoyed developing his relationship with the orchestra through an increasing amount of directing. He has also created the innovative leadership development event Podium, which has become an important strand of the LMP’s work and is gaining a strong reputation in the business world. Away from the LMP Simon enjoys a varied career as a chamber musician, soloist and orchestra leader. He has been a member of the Schubert Ensemble for twenty-three years, with whom he has performed in over thirty different countries, made frequent broadcasts for BBC Radio 3 and appeared regularly at Europe’s major venues. After 35 years at the forefront of British chamber music the Ensemble will retire in 2018, leaving behind a legacy of over 80 commissions, 25 CD recordings and a large library of live performances on YouTube. 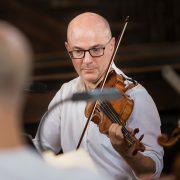 Simon is also in demand as a guest-leader and guest-director and has appeared in this role with most of the UK’s major orchestras. Since 1999 he has been one of the leaders of Orchestra Ensemble Kanazawa in Japan, with whom he has recorded Vivaldi’s Four Seasons for the Warner label. As a soloist he has made recent appearances with the Philharmonia Orchestra, the Academy of St. Martin-in-the-Fields, the RPO and the CBSO. Simon is a keen exponent of new music. He has given over 50 first performances and has had new works written for him by, amongst others, John Woolrich, Tansy Davies and jazz legend Dave Brubeck, as well as violin concertos by David Knotts and Jeff Moore.